It so happened that about a week back I went for my daily vegetable shopping and during that I picked up the regular stuff ..onion, potatoes, green chillies, garlic, ginger, coriander etc. After I returned home and started cooking I realised that the ginger I picked was some what different, it did not have the sharp smell and pungency of the regular ginger and then looking at it I realised that it looked a bit different too. I decided to taste it and was quite surprised with the taste, it had a mild flavour of the regular ginger and also of mango, I realised what I had picked up was Mango Ginger. I had heard about this but never used it till date. I knew that it was used in making pickle with the combination of mango. So, the next day I got the raw mango too and decided to make a chutney using the both. 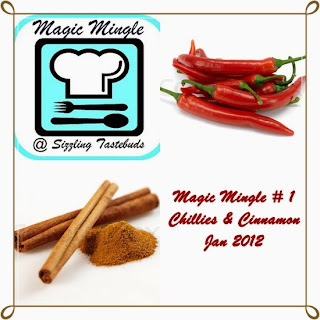 I wanted to add some unusual/ different flavour to the chutney and was wondering what to add when I received Kalyani’s mail informing me that the Monthly Mingle ingredients were revealed. I decided to settle on cinnamon. Now, chillies are a regular addition in most of the chutneys but the addition of cinnamon gave a very neat, subtle flavour to the chutney. I was myself pleasantly surprised, when so many natural flavours, with such subtleness, played music on my palate. I was surely happy that my experimentation with Mango Ginger turned out so fruitful. I used the chutney in making sandwiches for the kid and believe me this chutney is excellent for digestion with all the advantages of the mango ginger and cinnamon. Grind all the ingredients together to a coarse paste and then temper it with mustard and asafoetida. Note- Store in airtight container. Sending it as my first entry to Kalyani’s Magic Mingle. Finger licking delicious chutney Pari. A wonderful chutney...nice use of the ingredients. Chutney looks so delicious and mouthwatering. Yummy and delicious chutney !! Mango ginger is a very flavourful ingredient. Really like how you've used it to make a chutney. Mango n Ginger must have been a yum combo!!! Chutney with mango ginger is very inviting .. love the flavors. Thx for linking to the event.